On Halloween morning, the members of the Durham Academy Pep Band skipped from the Upper School music room to the quad across campus, clicking their drumsticks and buzzing their horns. Once the musicians set up the music stands, the drum kit and guitar amps, they began to warm up on their own, jumping up and down as the conductor, dressed as a fried egg, struggled to get their attention. For the first time in Durham Academy history, the Halloween parade brought together Upper School Music Director Michael Meyer’s music ensembles and the Pep Band (est. 2017) to provide some “spoopy” music for the Lower School Halloween parade. The program included “Thriller,” “Spooky Scary Skeletons” and “Monster Mash,” all complete with vocals. 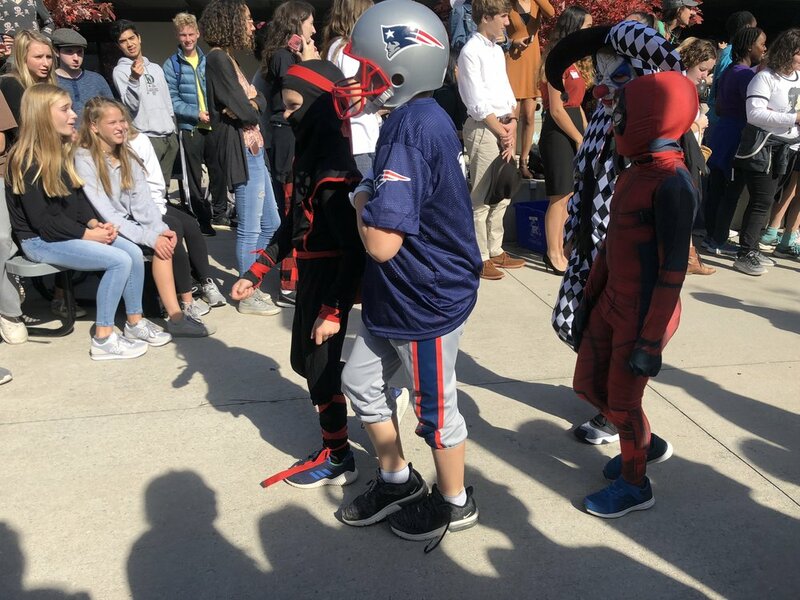 Each year, during the Lower Schoolers’ busy schedule of Halloween festivities, they make the trek to the Upper School to show off their adorable, clever or scary costumes. This year’s procession included sparkly jellyfish, big and little dinosaurs, princesses, pilots and an array of superheroes, including Black Panther and the Incredibles. Another new event this Halloween included a Pumpkin Chunkin’ contest, in which students lined up to throw 12 large pumpkins off the walkway between the double-decker and the Hock Building. Senior and Student Body President Jack Anderson said the Pumpkin Chunkin’ was a way to continue the Halloween fun all day long and to bring the school together through more festivities. And, for seniors, Anderson intended the activity to be stress-relieving on the eve of Nov. 1, the deadline for early college applications. There is much hope that these traditions will continue year after year—the DA Twitter account (@durhamacademy) has already referred to the Pumpkin Chunkin’ as an annual contest. Mr. Meyer said that the music ensembles and the Pep Band will continue to perform in conjunction with each other and expand their spooky repertoire over the coming years.